The density of today’s urban environments is deceptive: while physically substantial, cities can be quite vacant in terms of actual occupancy. Transactions between peoples, places, and events accelerated by the internet have lent themselves to a nomadic residency that not only contributes to material, space, and energy waste but also to the spiraling cost of housing as stock is artificially diminished. HBNY posits a human-scale solution for this urban-scale phenomenon: operable parenthesis-like divisions allow 12 on-the-go users to customize their dynamic patterns of inhabitation and share the spatial resources of a single apartment. Aluminum curtains provide parenthesis-like divisions of the open space so that users can temporarily customize their patterns of inhabitation. Through the way lighting reflects against the mesh curtains, varying degrees of privacy can be created. Mesh curtains can define paths as well as temporally frame spaces. 1. There are many urban areas where the residential density is apparently high… 2. However with the lifestyle of a new business-class urban nomad, such ‘high-density’ areas are only occupied less then one-third of the time… 3. With this low occupancy rate, what would happen if we created a system of residential sharing? There would be less material and energy waste and the artificial price of housing could be dropped. As the users only touch down in Manhattan briefly, the experience of the city must be maximized: the ”locker wall’ is set at a diagonal to open a wider cone of vision to the urban skyline. More than a hotel, less than a residence: an interactive storage wall allows all the users to store personal items. 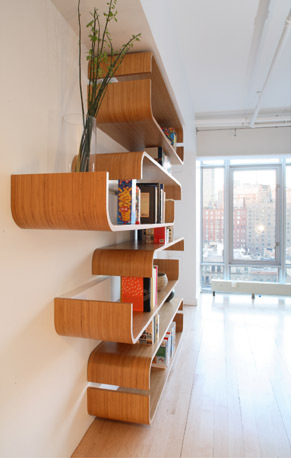 Horizontally adjustable ‘parenthetical sliding shelving’ allows differing objects and uses.